For all you sandwich lovers out there, here is a Vegan Portabella French Dip I made the other night that is WAY better than any fast food you remember. Slather on a little spicy brown mustard and you’ve got yourself one hearty sandwich! Sandwiches can be hard sometimes, I know, because other than a veggie sandwich, or some processed soy junk you find in the grocery store, what are you going to put on them? Sure, you can always make a good BBQ Sandwich with soy curls, or toss together some quick mock Chickpea Tuna, but what else? What about something a little more….meatier…. Portabella mushrooms have a chewy, beefy texture that can easily replace meat on any sandwich. 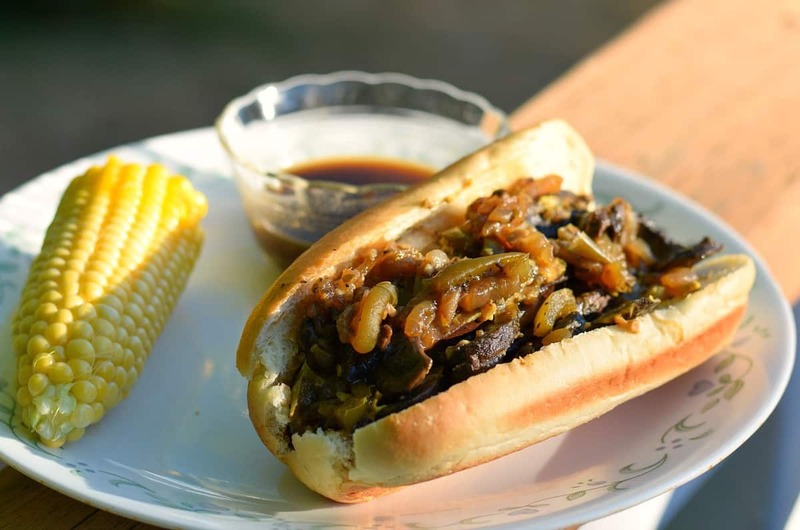 Add some caramelized onions, sliced peppers, and a tangy Au Jus for dipping and NOW you got a sandwich ! As for the bun…. and I ALWAYS get asked about the bun….. It can be REALLY hard to find a good bread or bun that doesn’t contain a million preservatives or oil. But what I do is always look for the one that has the fewest number of ingredients and the least amount of calories from fat. Unfortunately, these usually do NOT come with the lowest price tag. Dave’s Killer Bread is always a good option for bread, and so is the Ezekiel brand – but there really isn’t a lot of options unless you make it yourself from scratch. But if nothing else, these French Dips would ALSO go great topped on a Baked Potato….just stuff the filling inside a big baker and pour on the Au Jus! Take a LARGE sweet onion (vidalia, walla walla, etc) and slice it into thin rings. Also slice up 2 Green Bell Peppers and toss all of these veggies into a skillet. Sprinkle with ½ tsp salt – which helps draw out the moisture. Cook over medium heat until they begin to caramelize (turn a golden tan color). I did not need ANY liquid as my Walla Walla Sweet released a ton of its own. Just keep stirring so they don’t stick or burn. This caramelization process may take awhile – just be patient and just….keep….stirring. Meanwhile, rinse and dry 4 large Portabella Caps (I bought two 8oz packages) and then slice them into ¼” thick slices. When the onions are almost done….add a few teaspoons of chopped garlic and stir well to mix. Continue cooking for another minute or two and then remove the onion/pepper mixture to a separate bowl. Add the mushrooms to the skillet, and slowly sauté them until they begin to release their liquid. Use the 2 Tbs of Veggie Broth if needed to prevent sticking. Season them with the thyme and oregano. In a small bowl whisk the soy sauce, worchestershire, veggie broth, molasses, and liquid smoke together until smooth. I use a brand of Worcestershire called Cornet Bay. I found it at my local Fred Meyer and although it does not have the VEGAN label…..it has NO anchovies, like that other, BIG brand does. Once the liquid has just about evaporated from the mushrooms, slowly pour in the bowl of Au Jus and stir to mix. Season with salt and pepper to taste. Let those mushrooms simmer a little bit in the Au Jus and then carefully add the onions and peppers back into the pan. Mix well. Heat until bubbly and then carefully spoon the mushroom/onion mixture into one bowl, and strain the Au Jus into another. Serve with Potato Salad or French Fries. Hope you enjoy the sandwiches and thanks for all the comments! For all you sandwich lovers out there, these Vegan Portabella French Dip Sandwiches are IT! 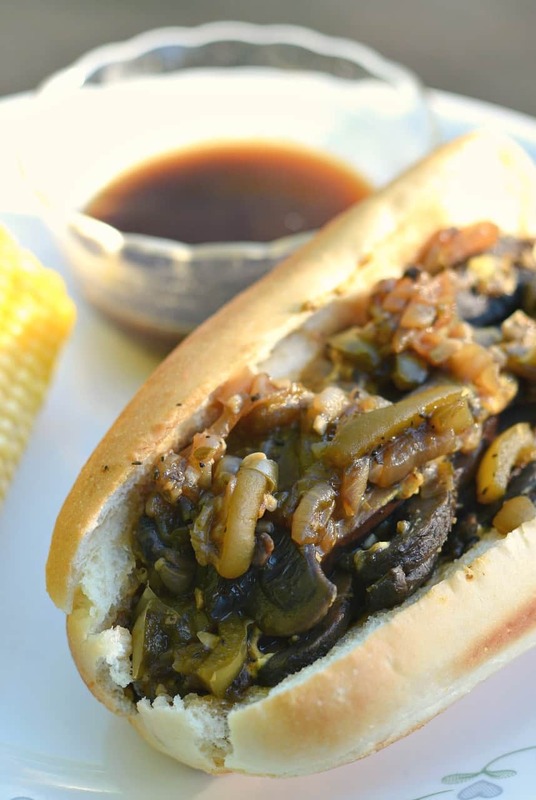 Mushrooms, caramelized onions, and a tangy Au Jus for Dipping! Slice onion and peppers into thin rings/strips and add to a large skillet. sprinkle with salt. Add 2 tsp chopped garlic and stir to combine. Continue cooking for 1-2 minutes and then remove to a separate bowl until later. Cut mushrooms into 1/4" thick slices. Add mushrooms to skillet and saute until they begin to shrink in size and release their liquid. Use up to 2 Tbs of Veggie Broth as needed to keep from sticking. Add Thyme and Oregano and mix well. In a small bowl, whisk together the Au Jus ingredients - soy sauce, worchestershire, veggie broth, molasses, and liquid smoke. When the liquid from the mushroom has almost evaporated, slowly pour in the Au Jus. Simmer mushrooms in Au Jus until heated through and then mix in the caramelized onions from earlier. Season with salt and pepper to taste. Heat until bubbly, and then carefully spoon out the mushroom mixture into one bowl, and strain the Au Jus into another for dipping. Assemble sandwiches on the bread of your choice and enjoy! I’ve made this twice now and love it! I made this the other day for the first time. WOW! With the leftovers, I mixed them with some other chopped veggies and an oil-free pasta sauce and put it over a homemade vegan pasta. Turned out great. I’ll definitely be making this again. Thank you, Chuck. I made this today for lunch with a chopped salad ! Added jalapenos and slices of tomato … SO delicious ! Thank you ! We loved this sandwich. I have made other similar combinations in the past but this is the best. Goes together quickly and is delicious! OMG! The only mistake was not doubling the recipe! Recipe is very good even though I had to make substitutions due to food sensitivities (no peppers but shredded carrots, mushroom broth instead of veggie broth and maple syrup instead of molasses, which I didn’t have). Chuck’s recipes are so great for me because they can accommodate and still be awesome. I can only imagine how authentic the accurate recipe tastes but my accommodations still made a delightful meal that will be repeated. I look to get some molasses given the description it adds to recipes. I think Chuck uses it in some other recipes. I will be ready. Oh my! A+ and 100% 5 Stars aren’t enough! This was delicious! We sliced a sourdough round loaf from Whole Foods. Churk – I have a question about portabellas. Do you scrape out the gills?